Star Trek Action Figures Return to Toys "R" Us! June 2013 - With Star Trek on everybody's mind again, thanks to the latest blockbuster film, Diamond Select Toys is bringing back Star Trek toys in a big way, to comic shops, specialty stores... and even Toys "R" Us! 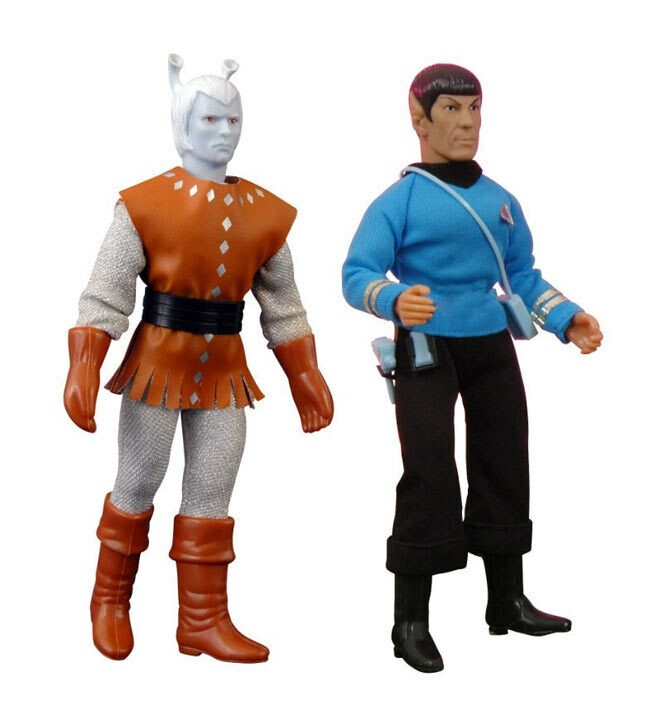 In addition to the previously announced TRU-exclusive assortment of Star Trek Legacy Minimates, DST is happy to announce that the iconic toy retailer will have their own exclusive edition of the two newest 7-inch action figures, Kirk and Spock! 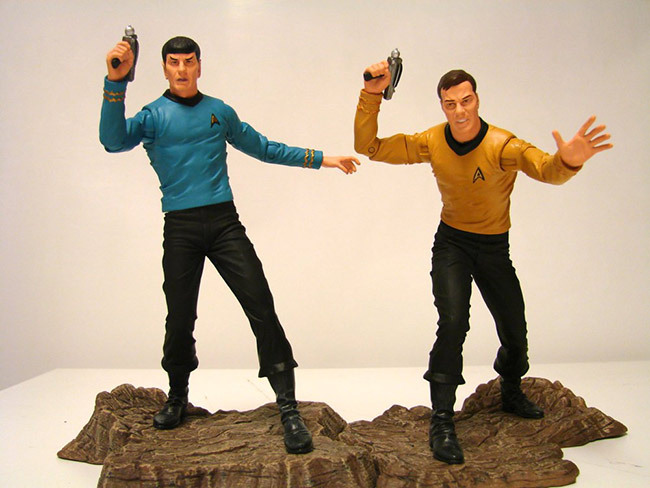 May 2013 - The ultimate Star Trek action figures are almost here! Arriving next month, the first two figures in Diamond Select Toys new, deluxe Star Trek line will be a classically-styled Captain Kirk and Mr. Spock, each with interchangeable parts and a diorama base. We got in a couple of packaged samples, and couldn't wait to bust them open and send them on an away mission! 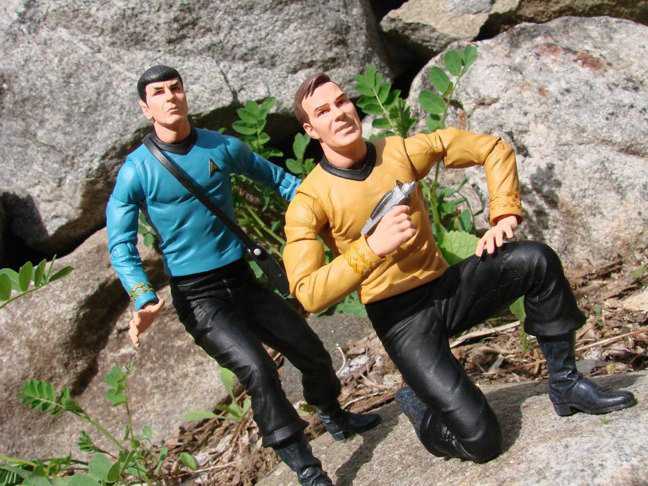 Check out the pics of Kirk and Spock in action on an alien planet – and in the Enterprise's engineering section – demonstrating their various interchangeable parts, including hands, legs, heads, accessories and more! Pre-order both today at your favorite online retailer or your local comic shop! Star Trek Select Line Gets Packaging Shots! 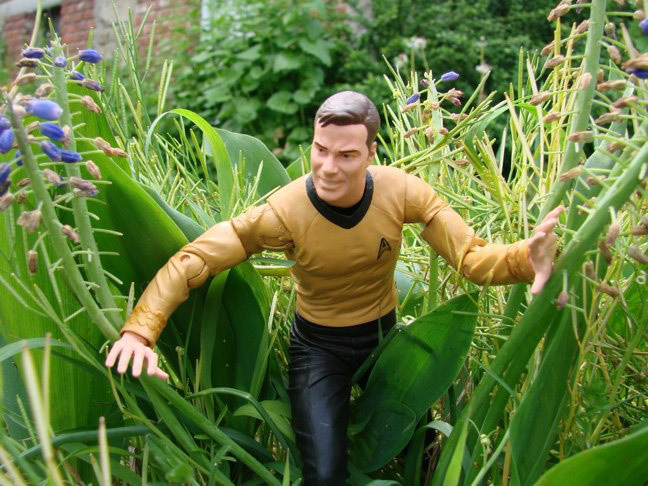 May 2013 - The Star Trek Select line is almost upon us! The new series will feature the first new 7" Star Trek figures to come out of Diamond Select Toys in quite some time, and we're pretty excited about it. With detailed sculpting by Patrick Piggott, each figure comes with multiple interchangeable parts and a deluxe diorama base, as well as a second, non-poseable figure to interact with! 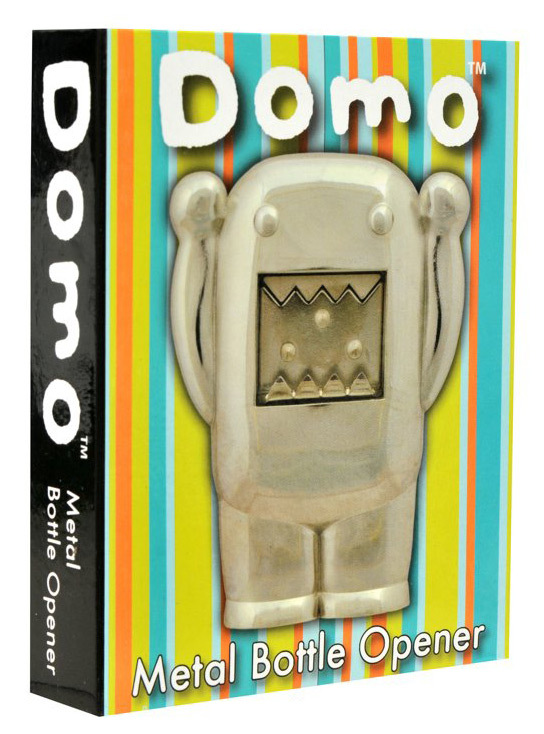 And now we have packaging pics! 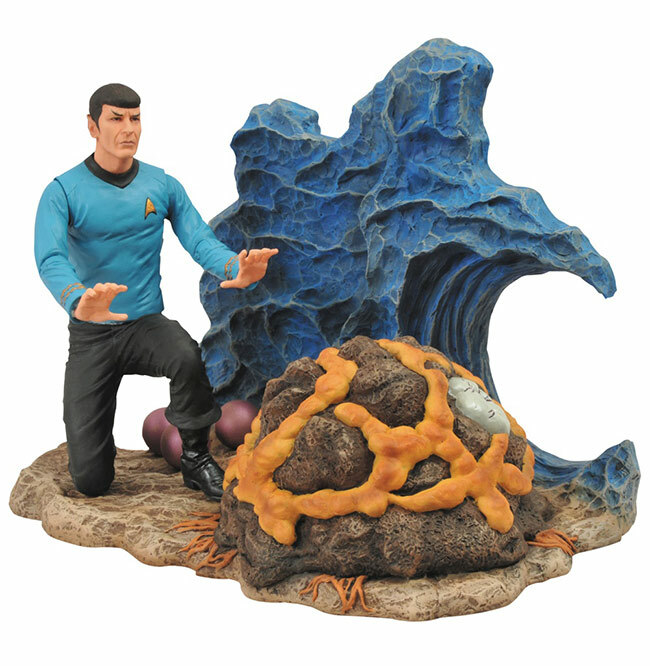 Mr. Spock is captured as he appears in the classic episode "Devil in the Dark," with a cave diorama and a Horta alien -- the first Horta toy ever made! 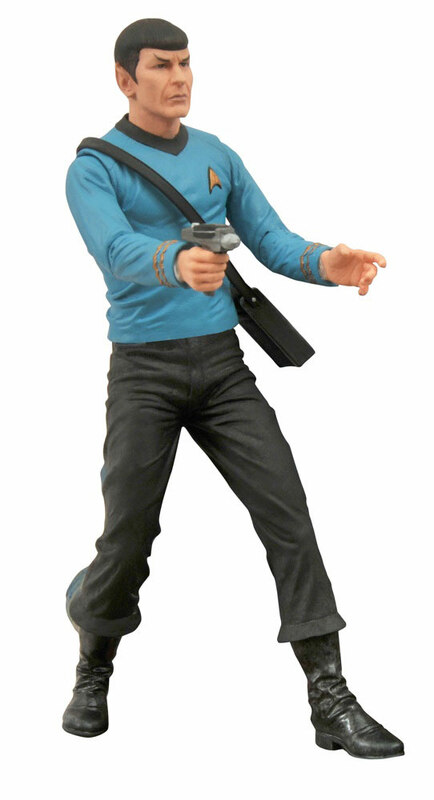 Spock himself will have interchangeable legs for standing or crouching poses, and interchangeable hands to hold a phaser or tricorder or establish a mental link with the Horta. 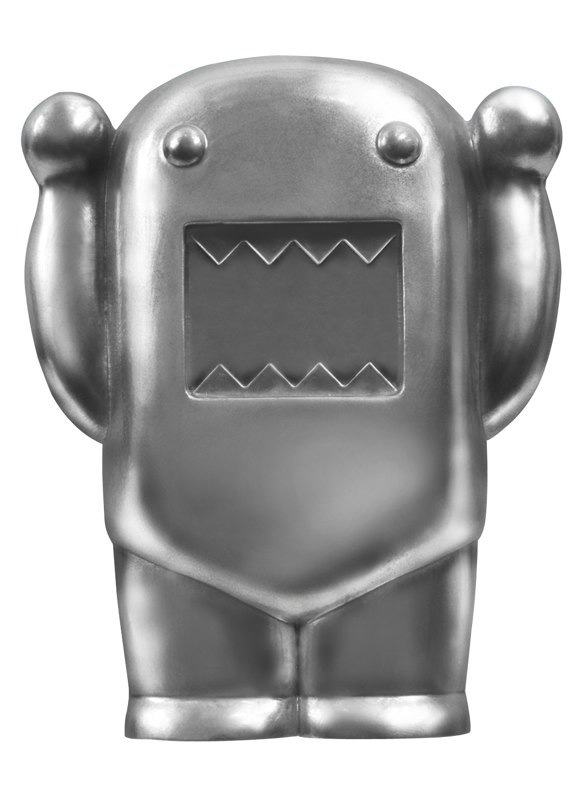 He even comes with an alternate grimacing head! 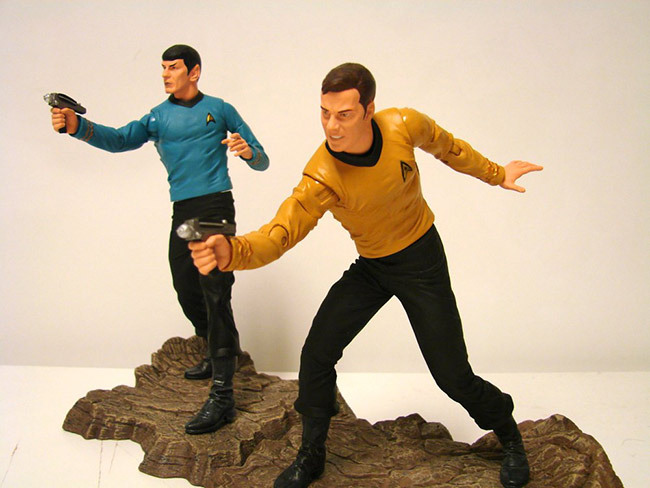 Star Trek Select is the Next Generation of Trek Collectibles! August 2012 - For years, Star Trek fans have repeatedly opened hailing frequencies, demanding the return of 7-inch Star Trek figures -- well, Diamond Select has heard their transmissions! This winter, DST plans to release the first in a line of Star Trek Select figures, depicting iconic characters from across the Star Trek universe in the 7-inch scale fans have asked for. Each figure will come in DST's famous Select packaging, and will include a diorama-style display base as well as interchangeable parts to recreate scenes using that diorama. 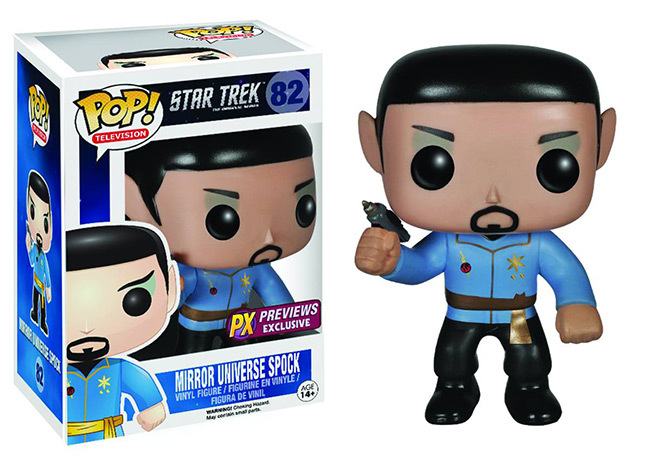 And the first release in the line is the most iconic Star Trek character of all, Mr. Spock! March 2012 - Classic Star Trek fans rejoice! Leonard Nimoy will reprise his role as Mr. Spock on this Thursday's episode of The Big Bang Theory -- but he won't be playing the role by himself. Instead, Nimoy will lend his voice to an 8-inch, cloth costumed Mr. Spock figure from Diamond Select Toys' Star Trek Retro Cloth action figure line! An exact replica of the classic 1970s Mego figure (faithfully executed for Diamond Select by the designers at EMCE Toys), Mr. Spock has a conversation with Sheldon Cooper (Jim Parsons) in a dream, and convinces Sheldon to open up a rare, mint-in-box Teleporter Playset (released in the U.K. by Palitoy in 1975).